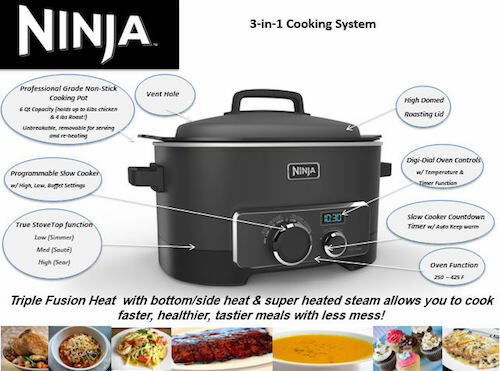 The Ninja 3-in-1 Cooking System surrounds the meal to cook faster with more flavorful results. 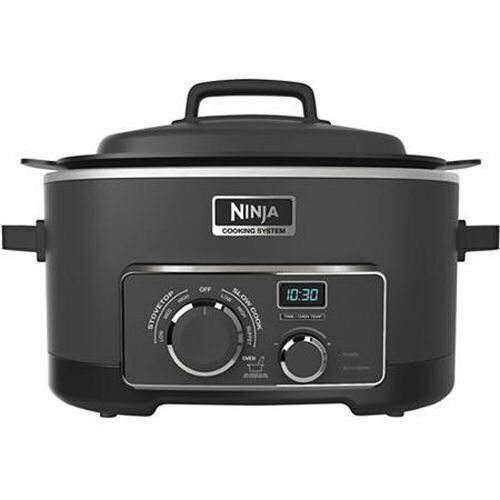 Three cooking functions bring one-pot multi-cooking to a whole new level for endless meal creations taking only minutes to prepare. Steam, roast, bake and perform stovetop cooking and serious slow cook complete family meals. Use the oven function for steam-infused roasting to cook 30 percent faster with 30 percent less fat than conventional ovens, or for steam-infused baking using 50 percent less fat for moister, better tasting results with fewer calories. Sear using the Ninja 3-in-1 Cooking System's stovetop function first (locking in all the great flavors), and then switch over to slow cook all in one appliance. The oven has digital dial temperature controls from 250 to 425 degrees with a 6-hour timer. The stovetop function can be set to low (simmer), medium (saute) or high (sear). The slow cook function is programmable with low, high and buffet (warm) settings.